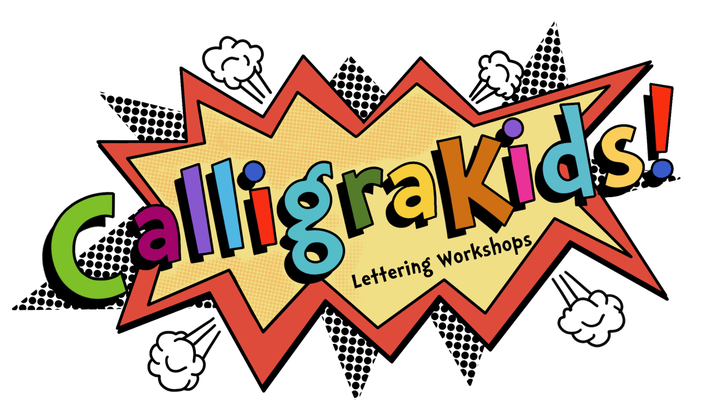 Calligraphy and Lettering for Kids! Week 1. CALLIGRAPHY. Learning and practicing the nine basic strokes. Go through minuscules (lower case) once. Pen and worksheets included. LETTERING We will discuss inspiration and where to find it. We will then look at the anatomy of letters and how they are formed. Using templates we will create our first letters, and try to think of as many decorative ways to fill them as we can! CALLIGRAPHY..Warm up with the strokes , review the letters and start joining to form words. LETTERING. using templates comprised of four basic parts (stem, stroke, crossbar and bowl) we will form letters and discuss adding serifs. Then we will explore changing the shape of the four parts to see what we come up with. Now it’s time for the extras! Embellishments like clouds and stars, flags and ribbons, laurels, florals and more!